So, I belong to a modern quilt guild, and they have a charity challenge where we're supposed to make a baby quilt for a local organization that takes care of underprivileged toddlers. So here's what I did. I used quilt-as-you-go for a wonky log cabin--not terribly modern, but it is a bit wonky, so I'm assuming that will work. I'm ready to bind it, but I realized that I need to do some additional quilting since I just noticed that the batting required 4-6" spacing and the center block (with the applique) is 15" square. I imagine that quilting around the heart and around the figures and along the vines will take care of that square, but I need to do something on all the wonky logs. I would love some suggestions. How 'bout some butterflies and flowers? It looks like you have those in the center square. I also love feathers. 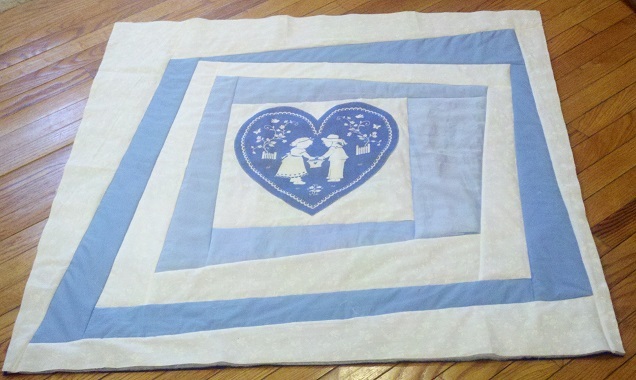 I have noticed that more modern quilts often seem to have a lot of straight line quilting in it. You could echo around each of the strips with the spacing of the echo being uneven. I would draw lines on first. Fast and simple. I will look to see if I can find a picture of what I am thinking about. ​I think straight lines of stitching will add some great texture and add to the modern look. You could echo the shapes or do every other frame in a different direction of lines. I agree straight line quilting! For the modern look, anything geometric will work. You could even do different sized zig zags in the wonky logs, centering them over the seams with the points extending into the logs, or treat all the blue and white logs as one area and do something geometric overall. Different sizes of rectangles and squares, with some of them overlapping, would look nice, and be super easy if done as a continuous line. How about some good wishes/mottoes in script around and around?